First of all, apologies for not updating this blog for two whole weeks. I have been utterly swamped by seminar reading, my dissertation and various other third-year woeful occurrences I won't bother boring you with. Phew. Now some people might laugh, find it humorous, or at the very least, allow themselves a cheeky wry smile. "Oh, look at the puns!" "Ann A. Kupp - ho, ho, ho! Geddit?" "'Enlarged?' Oh my!" etc etc. And I'm not going to be ridiculous and say it's an insult to women, feminism and the like (because some of the stuff is amusing). 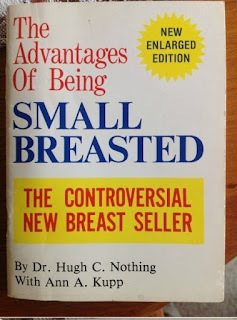 But it quite literally belittles the issue of breast-size. I'd even go as far to say it mocks those who are small-chested. 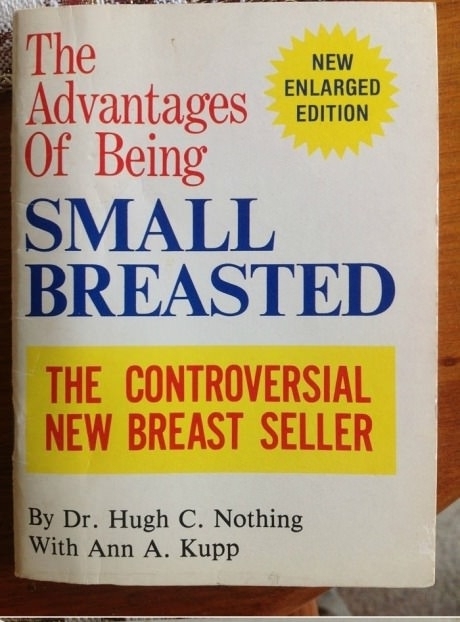 When I saw the link, the first thing I saw was the main title "The Advantages of Being Small Chested." Great! I thought, Here's some motivational literature, at last, that celebrates those who aren't the Kim Kardashians of the world. But then... ah, yes. Here we go - people failing to take the issue seriously... AGAIN. It's things like this which make my cause pretty difficult. How can girls love themselves when things like this exist? Yes, I know it's a light-hearted joke. However, how many books do you see that mock women with an average cup size? Admittedly, magazines and glossies will always gossip about breast augmentations (Does it look natural? Will she get them even BIGGER next time?) but never do they make women feel inferior for it. And if on the rare occasion, they do, the women who have had the surgery have chosen this. Women like me, and other small-chested ladies, haven't. So this kind of literature, as "hilarious" as it is, does unfortunately carry negative consequences with it. 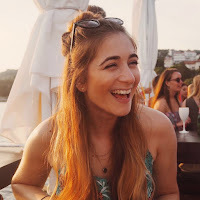 On a positive note, I did a cheeky bit of Google-ing and found this amazing blog page which all small-chested ladies should check out. I did search for a serious book about advantages but NONE CAME UP. A gap in the market, perhaps? A massive thanks to "New Adventures of Christine" - good going, girl! I particularly like the illustrations.